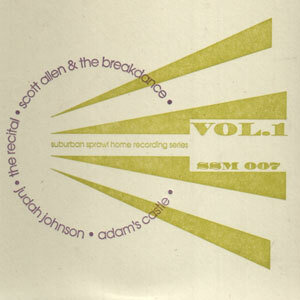 "Home Recording Series Volume One"
Featuring 3 tracks each from Adam�s Castle, Judah Johnson, The Recital, and Scott Allen and The Breakdance. These limited edition CDs are hand packaged into fancy letter pressed cardboard sleeves. "Sandal Jive (Live at Baker's)"
"There's No Shame in Letting Go"
"When a Fellow Gets Fresh"
"The Parade of Ugly Voices"
"Darling, I Wish You Were Dead"